UDM Downloads > SysTools BKF Repair Tool! SysTools Launched new advanced 5.4 version of BKF Repair Tool. Are you searching for the perfect external application tool to repair corrupted BKF files? Get SysTools BKF repair tool which is the greatest external tool to recover or restore corrupt BKF file along with extract BKF database easily. You can perform the procedure for backup repair and also corrupt backup system recovery by performing selection scan if you want to extract only selected files which are corrupt from the backup system. 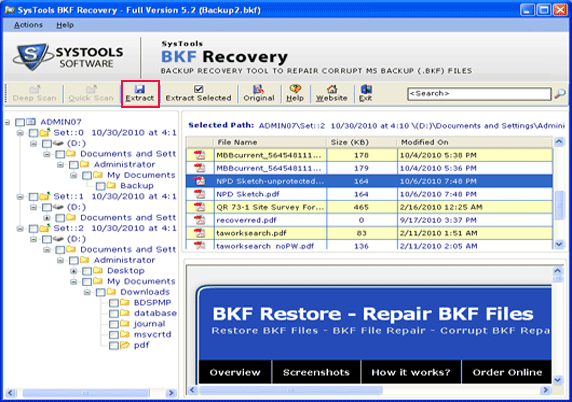 SysTools BKF Repair Tool removes all inconsistencies present in the BKF Files stored in the Backup system and helps the user to have a preview of the file to be extracted before initiating the backup recovery process. You can test the functioning of SysTools BKF Repair Tool by downloading this tool from our website. To order full version, you need to pay $89 which is the appropriate price of this tool.